For Canadians, there’s always an opinion on hockey, a devotion to maple syrup and of course, a common dislike – Toronto. Being the centre of the universe in Canada isn’t easy, but the city does it well. And for those who have never spent time here or have only seen Yonge & Dundas – you don’t know this city. For those who live and work in the 416, we get to see the many facets of the city, and for me, I’m happy to see the artistic community growing and growing. In the past 10 years the city’s main art galleries and museums have all been renovated and expanded including the Art Gallery of Ontario, Royal Ontario Museum and the Gardiner Museum. The Four Seasons Center for the Performing Arts, home to the National Ballet of Canada and the Canadian Opera Company is now a permanent venue for dance and music. This city also hosts unique art-related festivals – like Nuit Blanche, Luminato and Contact. And the city’s hidden gems continue to flourish despite the continuous construction of new condominium towers. In this city, there are many infrastructure projects underway, a necessary plan, but highly annoying to the residents. At the sound end of Allan Gardens, one of the oldest parks in the city, a watermain project will be going on for at least three years – but instead of just allowing the enclosure to be a reminder of progress, the city got smart. The plain wood boards are now a mural – the creation of 21 artists – named All My Relations, a visual history about the culture of the Aboriginal people. 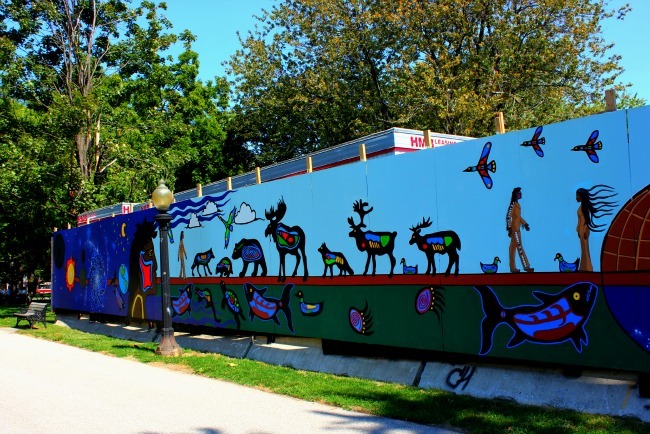 When the project is finished the enclosure dismantled, the mural will be donated to local Aboriginal groups. Done without any fanfare or major ceremony, the mural was finished in July, and adds a unique Aboriginal perspective to the growing number of cultures that call Toronto home. The bold colours and proud symbols of the mural seem perfectly at home in the midst of a park, well-used by locals and their canines. For a city that often gets knocked about for its noise, pollution, traffic and unfortunate Mayor, a decision to make the community a part of its ongoing future with one simple gesture shows what kind of city it really is.